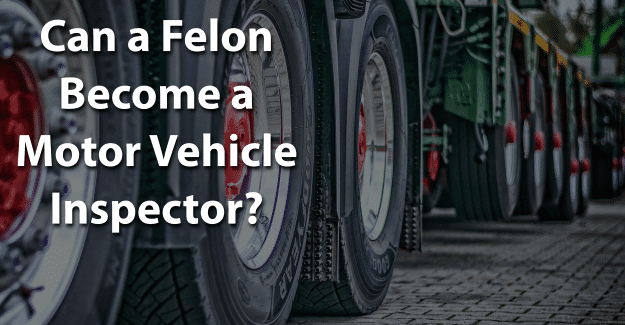 Can a Felon Become a Motor Vehicle Inspector? There are resources available for returning felons. Often it takes learning a new trade or starting a different career to demonstrate that they make good employees. For those with car and truck experience, becoming a motor vehicle inspector is a possibility. This blog post will address the issue of whether or not a felon can become a motor vehicle inspector. What is a Motor Vehicle Inspector? What is Required to Become a Motor Vehicle Inspector? How Much Does a Motor Vehicle Inspector Earn? A motor vehicle inspector inspects vehicles for damage and tests vehicle components for safety and emission issues that could prevent safe operation. There are several different types of inspectors, as freight trucks and other kinds of transports must be examined routinely for operation and safety issues. The most common type is those who conduct routine inspections on passenger and light transport trucks. Most states require an annual safety inspection of all such vehicles. A vehicle safety inspector is employed by the state to check vehicles for registration and inspect them for safety status. He or she must obtain a certification or license in his or her state. Each state sets its own certification or licensing requirements. All states require an inspector to complete an application for licensing or certification. The licensing exam typically includes a written test covering vehicle inspection information as well as a practical exam for demonstrating vehicle inspections skills. A vehicle inspection agency only hires qualified individuals. Generally, a person wanting to become a vehicle safety inspector must have worked in a related field for at least five years. To complete the training requirements, a candidate must complete at least 30 supervised inspections. He or she must also complete the Federal Motor Carriers Safety Administration (FMCSA) course. Many employers require job applicants to have at least one year experience repairing motor vehicles to qualify. Usually this experience must have been within the past five years to count as recent experience, which could be an issue for any felon who has just finished serving a lengthy sentence. Most motor vehicle inspectors complete training that combine classroom instruction and on-the-job experience. In most cases, certification is not mandatory even though employers may hire only motor vehicle inspectors who have certification. According to the U.S. Bureau of Labor Statistics, there are approximately 30,300 transportation inspectors, which includes all types of vehicle inspectors. The median annual wage for a transportation inspector in 2017 was $72,140. The median income is the amount at which half of vehicle inspectors earned more and half earned less. Level of experience and specialty certifications will affect how much a vehicle inspector earns. Location is also important with those working in the Northeast and Northwest having a higher salary than a vehicle inspector in other parts of the country. This area is expected to show a 4.3% job growth from 2016 to 2026, which is below average. A candidate to become a motor vehicle inspector may be ineligible due to various issues. Any offense that is directly related to the duties and responsibilities of a motor vehicle inspector may be ineligible. A felony conviction for any of these offenses will disqualify a candidate for at least 10 years from the date of conviction. If the offense was committed while working as a vehicle inspector, this will result in permanent disqualification. There are re-entry programs, such as drug treatment, and educational opportunities for felons who need them. For many felons, having their felony expunged can give them the chance they need to begin with a clear record and succeed in becoming a vehicle inspector. It’s a significant challenge, but it might be worth it for a felon that wants to become a motor vehicle inspector. Having his or her record expunged and also documenting any training programs or additional education could make the essential difference in a felon succeeding. What do you think about this blog post? Have you or someone you know been in the situation of trying to become a motor vehicle inspector with a felony? What was that like for him or her, and how did he or she achieve success? Please tell us in the comments below.